Learn from 30+ experts how to stay healthy and prevent chronic disease at this free online event offered September 21-28, 2015. Do you sometimes feel like the current healthcare system fails to meet your needs? Doesn’t really support your health and well being, but just offers ways to treat symptoms or take care of emergencies rather than really cure you or treat you as a whole person? If you’re feeling a little disillusioned and looking for answers and alternatives to keeping you and your family healthy, you might be interested in checking out this upcoming online event — the Evolution of Medicine summit. It will be free from September 21-28, 2015, so register now to take advantage! As you can see, quite a wide range of topics will be covered. In addition to the talks noted above, you’ll also find presentations addressing nutrition, heart health, diabetes, essential oils, the psychology of eating, and more. So, it seems very likely you’ll find something relevant to you or your loved ones. Plus, from my understanding, the summit will introduce an affordable alternative to health insurance, Liberty Direct. Sounds interesting, right? I know I’m looking forward to learning more considering the current health insurance rates! In previous summits I’ve attended before, such as the Abundant Energy Summit, about four video presentations were offered daily. You could access them at your convenience online, but they were only available for about 24 hours. So, if you want to know which talks are coming up, follow me on Twitter and/or Facebook, where I’ll be posting which presentations will be offered on a daily basis. Also, if you come to this post late in the game, it’s still worth registering for the summit. Often the final day is a bonus day, where you’ll get to listen to some of the most popular talks. Plus, when you register, you get access to a couple free talks as I mentioned before. By the way, as you start listening to the talks, don’t hesitate to ask questions or leave comments, especially if you come across something really amazing you want to share. And please let friends and family know about this great free event! 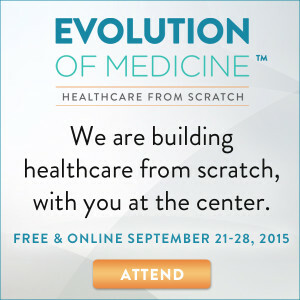 Will you join me at the upcoming Evolution of Medicine summit? Hope to see you there! Disclosure: As I’m a full believer in empowering yourself through education to enhance your own health and wellness, I signed up as an affiliate of The Evolution of Medicine summit. Missed the free summit? It’s not too late to catch it. Purchase the videos and transcripts here.